The various Configure- messages are used to negotiate configuration options in LCP and the other control protocols. In their Data fields they carry one or more options that are, again, specific to the protocol using them. For example, LCP uses one set of configuration options for the link as a whole; CCP uses options to negotiate a compression algorithm, MP uses it to set up multilink bundles and so on. Figure 35 shows how these options, which can vary in length, are placed in the Data field of a PPP control message (which is in turn nested inside the general PPP frame format). 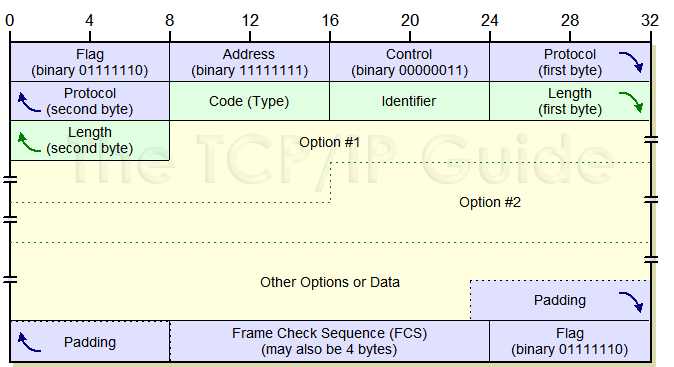 This diagram shows a sample PPP control message carrying options in its Data field. Any number of options can be included, and/or mixed with other data, depending on the needs of the message. Type: A type value that indicates the option type. The set of Type values is unique to each protocol. So, for example, LCP has one set of Type values corresponding to its configuration options, each NCP has a different set, CCP has its own set and so on. Length: Specifies the length of the option in bytes. Data: Contains the specific data for the configuration option. The configuration options are described briefly in the individual protocol topics. I am not showing the specific contents of each option as there are just too many of them. These are in the RFCs. Each option that appears in any of the many PPP control message types consists of this triplet of Type, Length and Data.